The Australian Catholic Bishops Conference’s Office for Youth, in partnership with the Archdiocese of Brisbane and the Australian Catholic University, will host the two-day youth and youth ministry research seminar in Brisbane next month. One of the features of the gathering will be the presentation of Australian research that was carried out last year as part of preparations for the Synod of Bishops on Young People, the Faith and Vocational Discernment, which will take place in Rome this October. More than 15,000 Catholics aged 16 to 29 participated in the survey, making it the largest survey of its type the Church has ever undertaken in Australia. Trudy Dantis, the director of the ACBC’s Pastoral Research Office, and her colleague Stephen Reid will present the findings of that research, as well as other statistical data that show the changing face of the Catholic Church and of parish life in Australia. 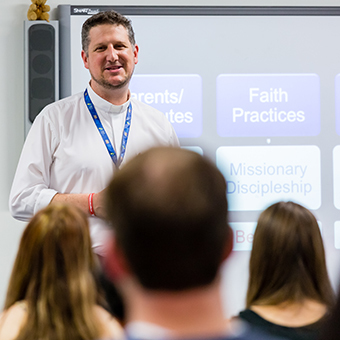 Malcolm Hart, director of the Office for Youth, said the seminar will allow those working at the coal face in youth ministry to better understand how their work is impacting young people and how they can better support the faith journeys of young people. “This will be a great opportunity for groups of people who don’t always talk to one another – researchers and youth ministers, sociologists and priests – to recognise the wisdom that they can all bring to a conversation about the Church’s engagement with teenagers and young adults,” Mr Hart said. He said the presence of American author John Vitek, who recently released a new report into the disaffiliation of young Catholics in the United States called Going Going Gone, will allow local experiences to be reflected upon in light of the American understandings. “We know that there are many differences between Australian society and American society, and indeed Australian Catholicism and American Catholicism, but there is a depth of research into faith and the experience of faith that has been carried out in the US and can be informative for the Church in Australia,” he explained. Mr Hart said the great value of the seminar, an initiative of the Australian Catholic Youth Council Research Task Group, will be in converting the understanding of that statistical data into practical strategies to enhance the Church’s significant work in ministry to young Catholics. “This gathering is one way that we are using the Year of Youth in Australia, which marks 10 years since World Youth Day in Sydney, to help us re-imagine our work and to recognise how our ministry can truly present the face of Christ to those who are seeking Him – whether for the first time or on a daily basis,” he said. Find out more information about the seminar, being held on March 9 and 10, at this website.